Timber frame homes are incredibly unique. They’re built using traditional, old-time European building techniques— the way manors, castles, homes and inns were built in the Middle Ages. They’re incredibly sturdy thanks to their solid timber beams and post-and-beam style construction. 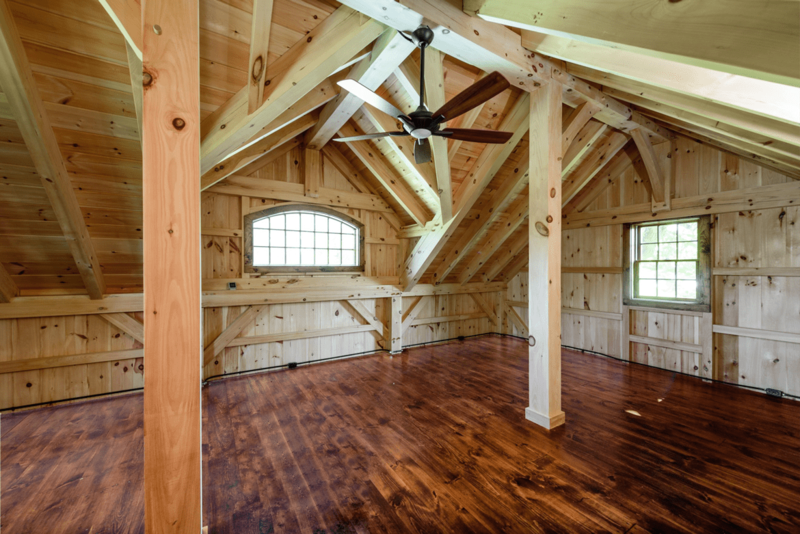 We use traditional timber framing in our own construction process, combining lap jointing and pegged mortise and tenon joints to create one-of-a-kind rustic chic luxury homes. Take this pool house for example: We built a unique, one-of-a-kind pool house featuring a traditional timber frame construction combined with a set of more modern, upscale elements that celebrate innovative design and master craftsmanship. One of our favorite projects to date, we brought in pieces of Northern White Pine milled by an expert local craftsman—each uniquely shaped and sized to create the iconic post-and-beam style construction. If you look closely at the arches at the top of each supporting beam, you can see the carefully hewn arches installed above the beam and below the post. The sturdy construction using the arches and beams means that the only thing it takes to hold them up is a series of wooden pegs. 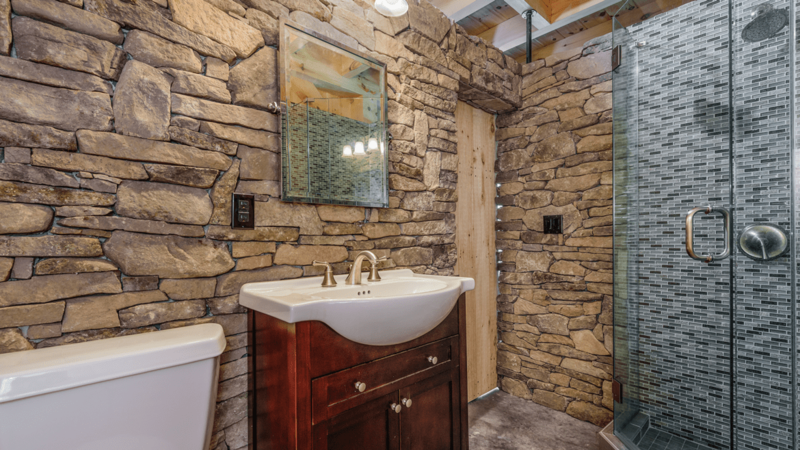 The bathroom features an ode to the traditional roots of timber frame home construction: a sliding antique Northern White Pine barn door with steel hardware (easier to see from the main room photo above). 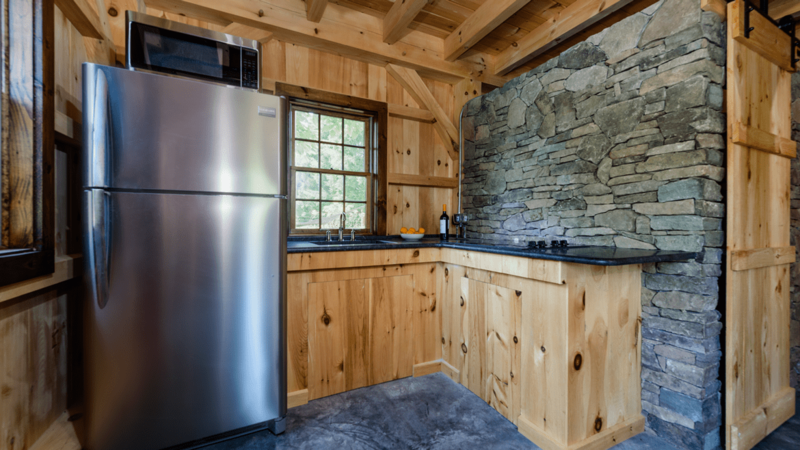 We constructed the walls out of Pennsylvania Ashlar Stone held up by antique hardware posts, complementing the rustic wooden door and main-room siding with textured, colorful stone. We took a more modern approach to the shower, which features a luxurious rain shower head and glass-tiled walls. We didn’t need to include a fully equipped kitchen in the pool house, so we stuck to a refined kitchenette with top-of-the-line appliances, including an electric cooktop and stainless-steel sink, paired with a Kitchenaid refrigerator. The flooring—like the rest of the main room—is cement slab with hot water radiant heat, perfect for entertaining year-round. The bathroom wall backs the space behind the cooking and prep area, which features a honed granite countertop in Rain Mist. The second floor was specifically built to be open to endless possibilities. It can be transformed into a second-floor bedroom, a game room, or a general entertaining space. We opted to give the Northern White Pine flooring a darker stain, deciding on an oil-based Minwax wood finish in Provincial. The exterior reflects the interior, featuring that same beautiful Northern White Pine. To complement the darker exterior, we also installed a cupola with a copper top, stained with Sikkens Cetol to create an orange cast. The gleaming copper and the stained siding is set in contrast to the Anderson French Doors with Venetian Bronze hardware. Interested in building your own timber frame construction? 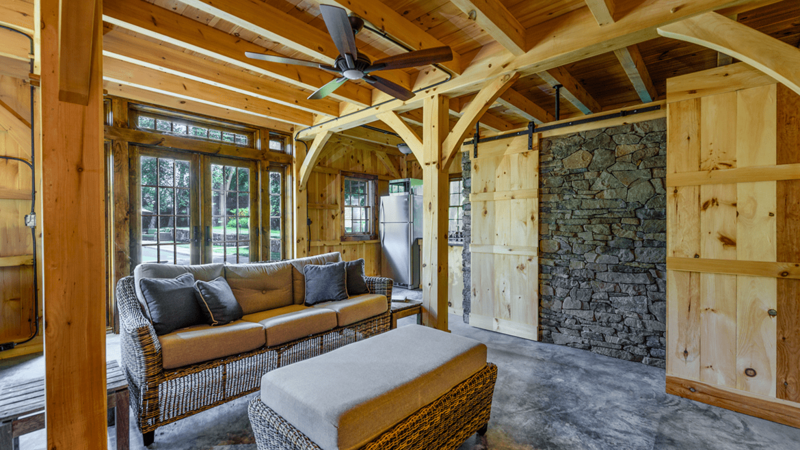 Whether you’re interested in building a timber frame home from scratch, or would like to include some of the elements of this project in your next home renovation, let us know.